In addition to performing established biochemical and cell biological assays, the HMS LINCS Center participates in the development and improvement of cutting-edge experimental methods. The goal of the Center is to integrate these new methods into our adaptive data collection approach. The following list of methods developed by HMS LINCS will be updated regularly as our work progresses. In proteomics, two fundamental types of multiplexing are available to increase throughput. 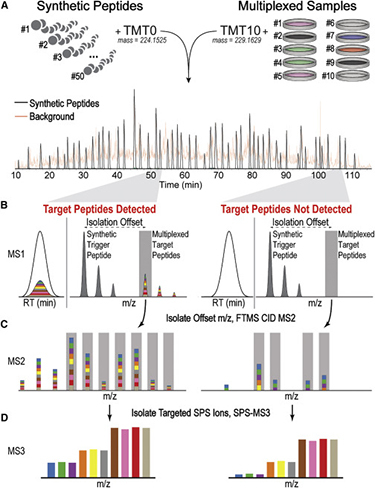 Many peptides can be targeted for quantification during a single run (peptide multiplexing), and higher-order multiplexing is possible at the sample level using a method such as isobaric labeling. Targeted mass spectrometry-based analyses have become vital for multiplexing the measurement of many peptides, but isobaric tagging-based multiplexing in targeted assays has not been demonstrated with unfractionated mixtures. Leveraging improved mass spectrometry instrumentation capable of sensitive MS3 analysis of reporter ions, we developed a 10-plex sample multiplexing strategy that enables accurate, targeted quantification directly from proteolyzed cell lysates. Traditional perturbagen-response metrics such as IC50, Emax, and AUC can vary dramatically, independent of the underlying biology, due to natural differences in cellular proliferation rate, variation in growth conditions, or changes in the duration of a dose-response experiment. We developed methods to parameterize growth rate data instead using normalized growth rate inhibition (GR) metrics, which yield GR50, GRmax, GRAOC, and hGR (Hill slope) values that are largely independent of cell division rate and assay duration. Importantly, only modest changes in experimental procedures are necessary to enable calculation of GR metrics from perturbagen-response datasets. There is an emerging need in numerous fields of biological research to increase the multiplicity of single-cell measurements. Multiplexed single-cell techniques have the potential to reveal important interdependencies between a cell’s local environment and its differentiation status, signal transduction pathway activity, and morphological phenotypes that are not evident when each feature is measured independently. To this end, we developed a robust, multiplexed immunofluorescence imaging method, named Cyclic Immunofluorescence (CycIF), using public domain chemistry and existing instruments that enables low-cost, high-dimensionality imaging assays at the single-cell level. Discriminating different mechanisms that compromise drug sensitivity in cells in culture requires multiplexed readout of response, which is often accomplished using mRNA profiling, multiplexed gene expression reporters, and high-content imaging assays. These assays can be highly informative but typically are costly and complex. Furthermore, it can be difficult to infer alternative mechanistic effects on drug response pathways from gene expression and other multiplex readouts where the relationship between readout and drug response pathway is complex. Here, we describe a new one-step, no-wash imaging assay that uses three dyes (Hoechst33342, LysoTracker-Red, and DEVD-NucView488) to stain living cells and enables measurement of multiple physiological changes in cells related to mitotic and apoptotic status following treatment with anti-mitotic small molecule drugs. Kinome-wide profiling aims to provide a systematic, unbiased look at kinase levels and modification states across biological and pathological processes. Current kinase analysis methods, however, are low in throughput and often poor at detecting low-abundance kinases unless time-consuming cellular fractionation steps are undertaken. We describe here a robust method that combines ActivX ATP probe (AAP) affinity reagents (ATP analogues) with 6-plex tandem mass tag (TMT) isotopic labeling of cell lysates and enables multiplexed analysis of ~90 kinases across six conditions in a single LC-MS run.